Stevenson introduces Marsha Colbey, a poor white woman from Alabama. He opens with Marsha marveling at her freedom as she prepares to speak before a crowd in New York City, three months after her release from prison. He rewinds to explain that when Hurricane Ivan hit in 2004, 43-year-old Marsha and her husband Glen were left broke and out of work, struggling to care for their six children. They received a FEMA camper, but then Marsha became pregnant. Stevenson describes her as a loving, dedicated mother, who had no money to seek prenatal care. She gave birth in a bathtub to a stillborn baby, Timothy, whom they buried in their yard. A “nosy” neighbor became suspicious and called the police to investigate the “absent” baby. The baby’s body was exhumed, and a forensic pathologist who had a history of unsupported declarations of homicide declared the baby was murdered. By narrating the series of setbacks Marsha faces before her imprisonment, Stevenson illustrates how women can be disproportionately affected by unfortunate circumstances like poverty, lack of access to medical care, and natural disasters. By beginning the chapter with Marsha considering her freedom after her release, Stevenson provides the “ending” to Marsha’s story first, which generates interest in how Marsha ended up in prison. At the same time, this image displays Marsha’s resilience. Stevenson shows how Marsha’s suffering is compounded by the suspicion and mercilessness of the community and police. Marsha was charged with capital murder. At Marsha’s trial, medical experts testified that there was no evidence of murder and that stillbirth was likely due to Marsha’s age and her high-risk pregnancy. Although their forensic evidence was debunked, the prosecution presented Marsha’s living conditions, past drug addiction, and lack of prenatal care as evidence of parental neglect. In Marsha’s case, the prosecution focuses on using Marsha’s poverty and past mistakes to create an image of her as a bad mother, which is then conflated with murdering her son. Like Walter, Marsha is subjected to discrimination and character defamation in the absence of scientific or logical evidence. Stevenson writes that by the 2000’s, media sensationalism about homicidal moms like Andrea Yates and Susan Smith motivated police and juries to criminalize mothers for child deaths without evidence. He writes that insufficient medical care positioned poor women as easy targets. He describes other cases of women convicted of murder after a stillbirth or even false pregnancies. Stevenson describes how mothers have often been charged with child endangerment because they live in dangerous, impoverished neighborhoods or can’t afford medical care for themselves and their children. He also describes women being jailed for drug use during pregnancy. Several of Marsha’s jurors admitted that they were too bothered by the idea of a homicidal mom to render a fair verdict, but the judge didn’t dismiss them. Marsha was convicted and sentenced to life in prison. Stevenson demonstrates the powerful role of the media in creating trends in criminal justice. He illustrates how media sensationalism kindles fear, anger, and suspicions, which then alter public perception of certain groups – in this case, of mothers whose children die. As these examples illustrate, the public then sees false parallels and draws simplistic conclusions, leading to rampant but unfounded criminalization. Police and courts are also affected by public beliefs. Similar to black men being condemned for their race, poor women are condemned for circumstances related to their gender and disadvantage. Stevenson writes about the conditions at Tutwiler Women’s Prison, where Marsha was incarcerated. As the only women’s prison in the state, it was incredibly overcrowded. Another problem at Tutwiler was rampant sexual abuse of female inmates and the prison’s unwillingness to address the issue. Stevenson writes that from the 1980’s to the 2000’s, the number of incarcerated women increased dramatically in the United States. This was partly due to increased incarceration for drug and poverty-related crimes like theft. Stevenson argues that the criminalization of poor women creates “collateral consequences”: it leaves children poor, unstable and vulnerable. Women with criminal records are often barred from social services, which further impacts their children. Stevenson writes that Marsha found women at Tutwiler to be very affected by each other’s struggles and moments of hope. EJI learns about Marsha from Diane Jones, a client who often advocates for EJI to help other women at Tutwiler. Through his description of the particular problems facing incarcerated women, such as sexual abuse, Stevenson illustrates how incarcerated women are vulnerable to different kinds of mistreatment and injustices under the criminal justice system. He also illustrates how the criminalization of poverty and drug addiction through harsh sentencing of nonviolent crimes disproportionately affects poor women and children. He suggests that this intensifies rather than addresses the underlying social problems. Stevenson demonstrates the humanity and empathy that many of the inmates display toward one another, which contrasts with the lack of empathy that those in power display toward them. EJI senior attorney Charlotte Morrison and attorney Kristen Nelson take on Marsha’s case. Each time they meet, Marsha informs them of the needs of women at Tutwiler. She brings to their attention the extent of sexual violence. Many of these rapes result in pregnancies, and even when DNA proves the officers’ culpability, the prison fails to respond. EJI complains to the Department of Justice and publishes national reports about the abuse. Eventually the prison is forced to reform its policies and hire a new warden. After three years of difficult appeals and petitions, EJI succeeds in securing Marsha’s release. At EJI’s annual benefit dinner in New York, they honor Marsha. Roberta Flack opens with the song “Isn’t It a Pity.” Stevenson tells the audience how Marsha’s twelve-year-old daughter proved the “kind of mother” Marsha was by “refusing to let go” of her on the day of her release. In Marsha’s speech, she cries about the women she left behind at Tutwiler. EJI’s choice to assign female attorneys to Marsha’s case suggests the importance of legal counsel with an understanding of and a stake in the client’s circumstances. EJI’s move to draw national attention to the conditions at Tutwiler again illustrates the power of the media and the potential for the media to serve as a voice for vulnerable populations. It also shows how media can force powerful institutions to be held accountable. By honoring their clients, EJI draws attention to the power of underprivileged individuals to advocate for themselves and others and the importance of seeing the strength and resilience demonstrated by their struggles. Marsha’s speech further reinforces her role as an advocate. Ballinger-Dix, Elizabeth. "Just Mercy Chapter 12: Mother, Mother." LitCharts. LitCharts LLC, 21 Jun 2017. Web. 25 Apr 2019. Ballinger-Dix, Elizabeth. "Just Mercy Chapter 12: Mother, Mother." LitCharts LLC, June 21, 2017. 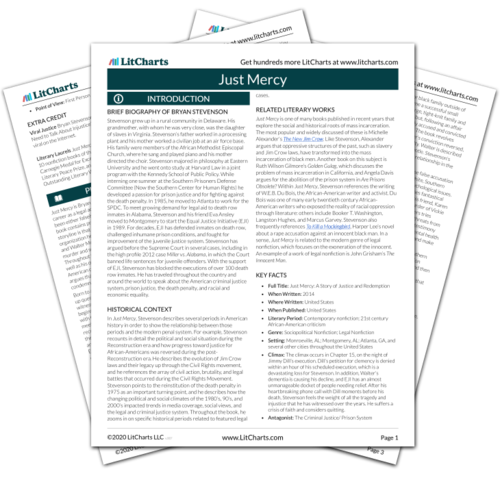 Retrieved April 25, 2019. https://www.litcharts.com/lit/just-mercy/chapter-12-mother-mother.